Half of a Problem on Negatives – Ideas for the Other Half? A fair number of kids in the class can already produce, for example, -7 as the answer if 1 is tripled and then 10 is subtracted. Some kids can’t though. I am looking to make the intro lesson rich enough for the kids who can already do this to remain interested, but my intention is to make no assumptions about what kids already know. I want to give them a problem that will make them interact with the idea of negativeness even if they’ve never heard of it. One idea is what I described before: consider a problem like 20+10 and ask what is the effect on the answer of adding 3 to or subtracting 3 from 10; do the same with 20-10; highlight the effect of the “added 3” or the “subtracted 3.” I love this idea in principle but actually I think it doesn’t really develop fast enough for a single late-in-the-year lesson with 6th graders who already have some exposure to negatives. When I originally had it I was imagining 3rd and 4th graders, and developing the idea slowly, with little short exercises over the course of weeks, to slowly draw kids’ attention toward the “subtracted 3” as a worthwhile object. So, another idea. Base the lesson around a problem that involves numbers going in two directions. Make the problem a little mathematically interesting. Don’t try to force the negative idea but make the problem impossible to solve without considering the directions of the numbers. I have an idea for the mathematical content of such a problem but I want to put it in a realistic context to allow kids to reason about it without knowledge of negatives, and I’m having trouble thinking of a context that doesn’t feel contrived. So this is a request for suggestions. 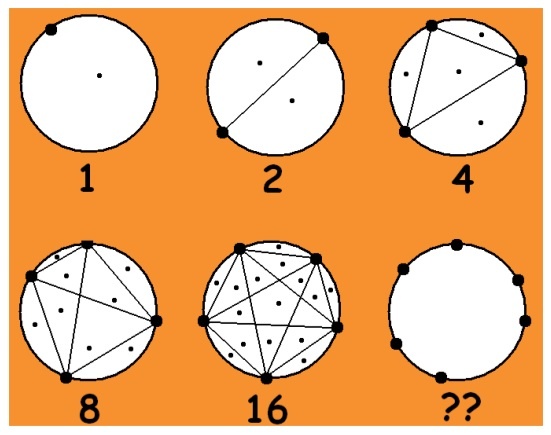 I am avoiding posting an answer (there is at least one; I haven’t checked whether there is definitely only one) so you can try out the problem if you want. I’ve been trying to compose a story so that (a) the positive and negative numbers have a concrete meaning accessible to someone who’s never heard of positives and negatives, and (b) there is some sort of reason why you’d know the target sums and the list but not know how the list sorts into piles, and yet you’d want to know. I have so far been stuck. I’ve been thinking about something like, 3 friends go gambling; A loses $12, B loses $19, C wins $7; for some reason (??) they know the individual transactions that took place (house collects $6, house collects $4, … , house collects $5, house pays out $9) but not who did which transaction, and for some even more far-fetched reason (????) they want to know. As you can see this idea isn’t really working. So: can you help me out with this? What I like about the problem is that a) it’s got that sudoku-jigsaw-like challenge even for someone for whom the actual arithmetic is elementary; and b) if I can find the right context to allow kids to reason about the problem concretely even if they’ve never heard of negatives, then the problem elicits as an answer what amounts to a set of equations about negatives, without the kids needing to learn anything new beforehand. Or, is the problem impossible to render in an un-contrived way? In which case, can you help me think of a less-contrived problem that accomplishes some of the same goals? So, I wanted to create a repository of problems and mathematical situations that could be used to freak students out and snap them out of the “it works twice it must be true” stupor, by suggesting a pattern that actually fails. I proposed a few; JD2718 suggested a few; and the real jackpot came from James Tanton, who devoted an issue of his newsletter to such situations back in 2006. Here is a pdf of the newsletter. Thank you Sue VanHattum for forwarding me this. Also, although I’d heard about James Tanton’s awesomeness from Bob and Ellen Kaplan, I hadn’t actually seen his website before today and it is clearly fresh, so check it out. Rows of the Pascal’s Triangle? I like this one as a counterpoint because the pattern is not completely wrong. Could you use this pattern to predict the number of digits in a high power of 3? All three of the above examples are awesome not only because the obvious pattern fails but because the real story is within the scope of many high school classes. Most of what follows does not have this virtue; but it’s still exciting to me because the patterns that fail, and the questions you could ask about them, are still accessible. Look at the pattern in the first number after the decimal point: 1, 2, 2, 3, 3, 3, … According to Tanton (I haven’t done the calculation myself), the pattern continues for a while: four 4’s, five 5’s, six 6’s. How many ways can n be represented as a sum of 1’s, 3’s and 5’s, distinguishing different orders? For n≥5, how many ways can you write n as a sum of natural numbers including at least one 5, this time disregarding order? These ones are easy to come up with because the primes just don’t behave. They are also somewhat harder to make into workable lessons because testing primality can be hard for students, even with numbers in the 2-digit range. *I made a brainstorm for a lesson based on trying to find formulas for primes here. The punchline is Euler’s beautiful n^2 – n + 41, which Tanton also gives a version of, which produces primes for n=1,…,40 but fails (why?) for n=41. 31, 331, 3331, 33331, 333331, and 3333331 are all prime! *Even numbers like 10 and 32 have an even number of factors, while odd numbers like 49 and 81 have an odd number of factors. Right?? A while back I mentioned that the awesome Catherine Twomey Fosnot was working on a book about algebra with mathematician Bill Jacob. It’s out. I just ordered it. (I tried to get a friend who went to NCTM to pick me up a copy at the publisher’s booth, but it was sold out before she got there.) It seems to be focused on the early grades, like the rest of the Young Mathematicians at Work series, which is a little disappointing to me since I was hoping for something directly applicable to Algebra I. But I’m sure it’s very thought-provoking and look forward to its arrival. Take-home lesson #1: the mathematical world’s understanding of negative numbers came incredibly slowly, in very gradual stages. We tend to treat learning about negatives like there’s just one big idea to understand. Really, there are like twenty. Reading these books has given me more respect than ever for the depth of the process we ask kids to go through between sixth and ninth grade as they get comfortable working with negatives. Take-home lesson #2: In the process of understanding a new and difficult idea, the ability to understand and use the idea to answer a question comes way before the ability to pose a question about the idea. So, it makes sense to get very comfortable with -2 as the answer to 5-7 before ever asking yourself to add -2 to something. Take-home lesson #3: The development of algebra is an important motivator, historically anyway, for the development of negatives. Pedagogical idea: How can we use this historical motivation to develop negatives with students? a) Al-Khwarizmi’s book contains a very limited idea of negativeness: that which has been subtracted. But since he is thinking about how to multiply, for example, an unknown with 2 subtracted, from the same unknown with 3 subtracted, he needs to see that, once everything has been distributed, the product of the subtracted 2 and the subtracted 3 contribute an added 6 to the total. It is not immediately obvious how this becomes a classroom activity but I think it definitely can. 20*20 is 400; how does taking away 2 from one of the factors and 3 from the other affect the product? We get kids thinking hard about this and it would support the most contrivance-free explanation for why (neg)(neg)=(pos) that I have ever seen. b) Allowing the coefficients of equations to be negative significantly cleaned up the theory of equations. Our students know more about negatives than the inventors of algebra did. It might be really exciting and powerful, increasing their appreciation for both negatives and quadratics, to show or let them develop the original (negative-impaired) theory of quadratics, and then have them use negatives to clean it up. The first of these books was written in Arabic, and published around 820 in Baghdad. 820. Just to make sure you didn’t miss that. The translation I read is 180 years old. The full text of it is available online. Both these books have been widely written about. I was reading them in the hopes of learning how these mathematical breakthroughs were understood in their own day. My original intent was to use this information to help me design the group theory course I am teaching. We are getting into the Galois theory of equations. The modern treatment of this subject, which is what I learned, doesn’t feel to me like it could serve as the basis of a natural and meaningful development for people who don’t already know it. (The way I learned it, which is how almost everybody learns it in this day and age, was the opposite of “natural” or “meaningful.” Very cool, but only in an after-the-fact sort of a way. Like you came to the show at the very end and only saw the climactic scene, and everybody in the audience gasped and shrieked, except you because you didn’t care about any of the people in the show because you just walked in one second ago. And then after it was over your friend explained to you what had been going on and you understood why the other audience members cared, and were kind of mad you hadn’t gotten to watch the rest of the play first. If that analogy made any sense.) My idea was, let me study how the theory of polynomial equations developed over time; then I’ll be able to put the class in the place of the developers of the theory, and so the insights will come about naturally, and make sense, and be compelling, against the backdrop of the questions they were designed to answer. Learning the historical context would be pedagogically fertile. As it happened, I overshot the historical mark a bit – for the purposes of the class, the mindframes of these two books are unnecessarily archaic. There is real pedagogical fertility here, but it’s around ideas that the participants in my class (who are teachers and mathematicians) already understand. On the other hand, I’ve taught plenty of students who don’t understand them. In particular, I found myself surprised and intrigued by what each book did and did not say about negative numbers. I felt like I was watching this idea (the negative) coalesce and congeal, roughly and haltingly, over time. Like a churning mixture of hard crystal clarity and murky goo. If I may. etc. And all the equations can be solved exactly the same way. But for neither of these authors had the idea of negativeness grown adequately supple to make this possible. These are the first two and last two in a sequence of 13 chapters. This is over 20% of the book. Not only does each equation type get its own method of solution, each method gets its own (geometric) proof. Histories of mathematics often mention the situation I’ve described here. For example, Mactutor’s history of quadratic, cubic and quartic equations says something like “the different types arise because Al-Khwarizmi had no zero or negatives.” This is the story I’d gotten before I picked up the originals, and what I found out is that it’s not true. Both books calculate comfortably with something translated as “negative numbers”. Ars Magna goes so far as to contain a calculation with imaginaries. But the scope of the idea of negativeness is limited, in a different way, in each book. And I think I learned something important about how people come to understand negative numbers by taking note of these limitations. If there are greater numbers combined with units to be added to or subtracted from them, then four multiplications are necessary; namely, the greater numbers by the greater numbers, the greater numbers by the units, the units by the greater numbers, and the units by the units. He is talking about FOIL in case that wasn’t clear. If the units, combined with the greater numbers, are positive, then the last multiplication is positive; if they are both negative, then the fourth multiplication is likewise positive. But if one of them is positive, and one negative, then the fourth multiplication is negative. The root of two hundred, minus ten, subtracted from twenty minus the root of two hundred, is thirty minus twice the root of two hundred; twice the root of two hundred is the root of eight hundred. My point is that Ibn Musa’s use of the idea of negativeness is so limited in scope that the word “negative” might even be sort of a mistranslation to a modern reader; however, this limited-scope idea fully supports all the rules of arithmetic we teach. Cardano’s understanding of negativeness is much broader. For example, in the first chapter of the book, he explicitly discusses the possibility that a negative number might satisfy an equation. But throughout, his dealings with negatives are marked by a kind of choppiness, an inconsistency. Firstly, he refers to negative solutions to equations as “false” or “fictitious” (as opposed to “true”). Then, once he gets into the nitty gritty of solving equations, he pretty much stops mentioning them entirely. For example in chapter 8 he says “it is evident that when the middle power is equal to the highest power and the constant, there are necessarily two solutions…” We would say there are three (1 negative), and Cardano would have acknowledged this third solution in chapter 1. The point that I am making is that if Cardano is any example, negatives are much easier to get your head around as an answer than as part of the question. Allowing coefficients to be negative would have caused a massive increase in the efficiency of the theory: as noted above, Cardano gave separate solutions for thirteen forms of cubic equations. With negative coefficients, these thirteen cases are reduced to 2: quadratic term is zero vs. nonzero. I don’t know when this cleaning-up of the theory actually historically took place. Avital Oliver, whom I mentioned in my last post, told me that noticing how much negative coefficients would simplify the theory of equations was a major reason, historically, that negative numbers gained acceptance as numbers. That makes sense to me. do have a common solution, namely 4. In chapter 1, Cardano asserted that a quadratic and its “turnaround” have opposite solutions: a “true” (positive) solution for one is a “fictitious” (negative) solution, equal in magnitude, for the other. So here, the original pair of equations have a common solution after all: -4. Cardano seems to feel (and I kind of relate) that the presence of the common positive solution between the turned-around equations and the formal relationship between the turned-around pair and the original pair means there ought to be a common solution for the original pair; the fact that this common solution turns out to exist if you allow negative solutions is then a reason to believe in negative solutions. Anyway, he follows with two problems about the property of a man named Francis. The problems are totally contrived but they lead to negative solutions for Francis’ property, which he interprets as meaning that Francis has debt. Tellingly, though, he sets up the equations letting -x be Francis’ property, so that the equations he actually solves have positive solutions. What am I getting at with all this? Well I can’t tell you what to think but I am left with a completely new sense of the natural contours of learning about negatives. I taught Algebra I for a long time. My students entered the class having trouble both conceptually and computationally with negative numbers. I did my duty and explained their meaning and operation, along with lots of practice for the kiddies, early in the year. Having always been concerned with understanding, I looked for models of negatives that would support all the operations I wanted kids doing. I wanted the model to instantiate as much of the mathematical structure as possible. The school I taught at had a woodshop program, and I got them to build me a board with a flat surface with holes cut in it and wooden pucks to fill the holes, so that I could physically model 1 + -1 = 0 and people would physically see how a hole combined with a wooden puck to make a flat surface. Subtraction of negatives would become removing holes, and this clearly required adding pucks to the surface; thus subtraction of negatives is adding positives. The model required another layer of contrivance to support multiplication: I had to ask students to imagine standing upside down, on the other side of the surface, so the holes became pucks and the pucks could be imagined as holes; then 3*-4 could be 3 people with the normal point of view, each standing by 4 holes, while -3*4 was 3 upside down people each standing by what appeared to them as 4 pucks. It didn’t work as the centerpiece of teaching about positives and negatives. The multiplication problems make the contrivance really obvious, but actually there’s a certain amount of contrivance even in how it models addition. If I combine some pucks and some holes, who says that the pucks need to fall into the holes? I made kids draw tons of pictures of the whole thing, which completely wore them out, and I don’t know how much it added to their understanding. Meanwhile, the model, as all models do, made problems bigger, clunkier. Subtracting -5 from -7 was no thing: just fill 5 holes. But subtracting (-5) from 1 was like a whole production. The kids either needed to create 5 holes by removing pucks from them (and retaining the pucks – why would you do either thing?) before adding 5 new ones to fill the holes, or they needed to make the intensely abstract and not-adequately-justified leap that because subtracting -5 amounted to adding +5 when you were subtracting from a negative, the same thing should be true when subtracting from a positive. Retrospectively the fact that I asked my kids to make this leap of faith and told myself that I was actually helping them understand how math makes sense is kind of embarrassing. Do you LOVE to LOVE? You’re a LOVER. Do you LOVE to HATE? You’re a HATER. Do you HATE to LOVE? You’re a HATER. Do you HATE to HATE? You’re a LOVER. But none of these cuter models supports addition or subtraction as well, and sometimes it’s hard to see that they are even related to multiplication. Meanwhile, the only model I’ve ever seen, besides mine, that supports all four operations is the IMP curriculum‘s “hot and cold cubes.” And if you see the contrivance and unnaturalness in what I described above, “hot and cold cubes” is another level. Again, I think it’s kind of a brilliant model. But if you’ve ever tried to use it with low-skilled kids, you know how much production is involved in even getting them to imagine and buy into the scenario in the first place, let alone use all that machinery to solve problems. It’s been a few years now that it’s seemed clear to me that the whole idea of teaching negatives through a particular model is not the way to go. People who use negatives effectively have gotten them down to a very slim abstract notion that supports all their operations and all their uses as representations of real things. (I would describe my own understanding with words like “opposite directionyness” – don’t laugh.) Teaching has to be aimed at this slim, efficient understanding as an end product. Forcing kids to engage with a whole clunky megilla of story and visual image every time they want to do a computation with negatives can’t possibly be the right path. In more recent years I’ve found much more effective ways to teach negatives. I’ve been beginning by brainstorming with my students what negative numbers are actually, in the real world, used to represent. Not just debt, temperature and elevation. These aren’t enough. They capture the “below zeroiness” but not the “opposite directionyness,” since the positive direction is so fixed in each case. Also needed are examples of net change: gain or loss of money by a business; football yardage; etc. Furthermore, examples where negatives are used to specify direction in space or time: say uptown is positive; what would negative mean? What if east were positive? What if downtown were positive? If positive 3 means the space shuttle took off 3 seconds ago, what would -3 mean? Using this conversation as groundwork has brought me much more success than the wooden board did, but there’s still something missing. It’s hard to find convincing examples familiar to kids that support multiplication, for one thing, except for the private tutoring student whose father was a stockbroker, because then short-selling a stock that goes down in price is (neg)(neg) = pos. But it’s more fundamental than that. I’ve still been starting from the question “what is a negative?” when the student’s only legitimate reason to believe negatives even exist is that school says so and her only legitimate reason to care is that she’ll be accountable for an answer. This question puts the cart before the horse. A corollary of that amazing conversation with Avital Oliver I described last time is that when I teach a new idea I want to cause it to be needed, or at least cause its presence to be felt, cause students to become aware of it in the room with them, before it is ever named. So “what is a negative?” is not ultimately my desired opener for teaching about negatives. What I’m left with after reading Cardano and Muhammad Ibn Musa is the beginning of an idea, modeled on the history of the concept itself, for what could take its place. So, here’s a curriculum brainstorm. It spans a lot of years and doesn’t fit in with anybody’s state frameworks, so I hope you’ll forgive the impracticality. I’m just fantasizing. First, laying the groundwork (inspired by Ibn Musa): When you do arithmetic, how does subtracting something from the numbers affect the answer? How does 20 + 10 change if I subtract 3 from the 10? (To focus attention on the key point, what does the subtracted 3 do to the answer?) How does 20 – 10 change? How does 20*10 change? How does 20*10 change if I subtract 4 from the 20? How about if I subtract 4 from the 20 and 3 from the 10? What if I add 4 to the 20 and subtract 3 from the 10? The point is to engage the students in sorting out all these questions. (Why would they care about these questions? That’s a whole other thing but I don’t think a very hard one, and it will depend on the group of students – but I’m sure given any set of folks we can find a context to make these questions compelling.) Note that there is no “new kind of number” here. Some 3’s are subtracted, some added, that’s all. We very gently call their attention to the “subtracted 3” as an object worth talking about, but they already know what we mean; there’s nothing new to learn. I think this sorting-out is going to attune students’ antennae to the frequency in the universe on which negative numbers live. Much later, once negatives come into play, stay respectful of the fact that they make sense as answers more easily than they make sense as questions. What number could you add to 7 and get 4? (No number! Even if you add nothing, it’s still 7.) If you could add something, what would that thing be like? In other words, bring forth the idea of negativeness as the answer to questions. (Perhaps your earlier “subtracted 3” will be what they come up with; perhaps not.) Do a lot and a lot and a lot of this, before ever asking anybody anything about negatives. Later still, it will be time to develop equation solving intently. The way we do this in Algebra now, we build in the necessity for the methods to generalize to negative coefficients. Instead, start it earlier and use Muhammad Ibn Musa-typed problems. Let them develop techniques that feel most natural to them. (From lots of classroom experience, I can tell you that these will not be methods that generalize to negative coefficients.) Allow problems with negative solutions to creep in, but not negative coefficients. Negative numbers and their operations are becoming familiar, but still let the students do what’s comfortable in the realm of equation solving. Increase the sophistication of the equations; develop the solution of one of the three forms of the quadratic (what number can I multiply by itself, and then add 6 of itself, to get 40?). Pose problems in the other forms as well though. Finally, as a last act, lead them to the fact that allowing coefficients to be negative unifies all three cases of the quadratic into one and they can use a single method on all problems. How useful! Negatives are now official. I would really love to do this with an out-of-school math circle of youngish kids or mathphobic adults. I need to get on that. Two tidbits from these books that didn’t fit in with the main lines of thought above. There’s lots more where these came from but as usual I’ve already OD-ed so I have to draw the line somewhere.